I’ve been to Thailand more times than you can count on two hand. I love traveling the world, but somehow, someway, I always seem to end up back in Bangkok. Sometimes I’ll blame it on the fact that it’s just a great hub city. I can catch a flight to most places in Asia from here. Or perhaps my sister wants to meet up to do a little island relaxation time…and how do I say no to that? Twist my arm! But really, I keep finding myself back in Thailand because of the food. Plain and simple. The diversity of the culture leads to an incredible spread of food. And I won’t stop until I feel satisfied that I’ve tried it all (so never!). I arrived in Bangkok a week ago and hit the ground running. I’m actually working here this time. I’ve only ever been to Thailand to eat, so now I’m seeing a different side of things. I’m working with this guy who has been living here on and off for 10 years, so to say that he has a better grasp of Thailand is an understatement. I have a little Thai envy. I even bought myself a Rosetta Stone (pirated of course) so I can have basic conversations, but I popped it into my computer and it’s trying to teach me Yugoslavian I think! My Thai skills are on hold as of the moment. But that hasn’t stopped me from pointing at everything I’m interested in eating and saying “ow ee!!”. That means “I want”…and I use that phrase frequently. So there are several areas of Bangkok that I know pretty well, and then the rest of the massive city is elusive. This city is huge. Think LA sprawling huge, but densely packed with people, like New York. I’ve been to Chatuchak market every time I’ve been here. It’s the weekend market that basically turns into a small city on Saturdays and Sundays. Over 250,000 people visit the market each day!! That’s more people than the suburb I grew up in outside of LA. You can imagine how overwhelming this can feel. It’s a 35 acre area with over 8,000 stalls. I dare you to try and find that one stall you saw once with that thing you really wanted… It’s not going to happen. But Chatuchak is fun! And exciting! For all of 10 minutes. And then someone bumps you and you spill orange ice tea down your shirt. And perhaps someone tries to pick your pockets. I’m not saying it’s not worth it. It is. It’s just a matter of when you decide to go. Most guidebooks will tell you to go early in the day, to avoid crowds and the midday heat. But if you go midday…it turns out everyone else had the same bright idea. So you’re really just going to be packed in like sardines, trying to shuffle through the maze-like stalls, and end up spending the hottest part of the day bargain hunting. The real charm of Chatuchak is in the evening. Once the crowds start to dwindle and the heat subsided a touch, the market is much more enjoyable. There’s a stall in the center of the market that is renowned for its fried chicken. Fried chicken isn’t something I normally eat, but I was told it was journey worthy. So back at the market yesterday, grace to Buddha, I found the stall and sampled the chicken. And yes, it was worth every greasy, succulent bite. But that’s not all my advice for Chatuchak. Oh no. It’s a great place to eat. There are food vendors at every step. Coconut or pandan ice cream? Fried squid babies? Herbal jelly tea? How about some mini hot dogs with chili sauce? You can eat until your sides hurt here. But the truly gorgeous food is not at Chatuchak. softly sweet). 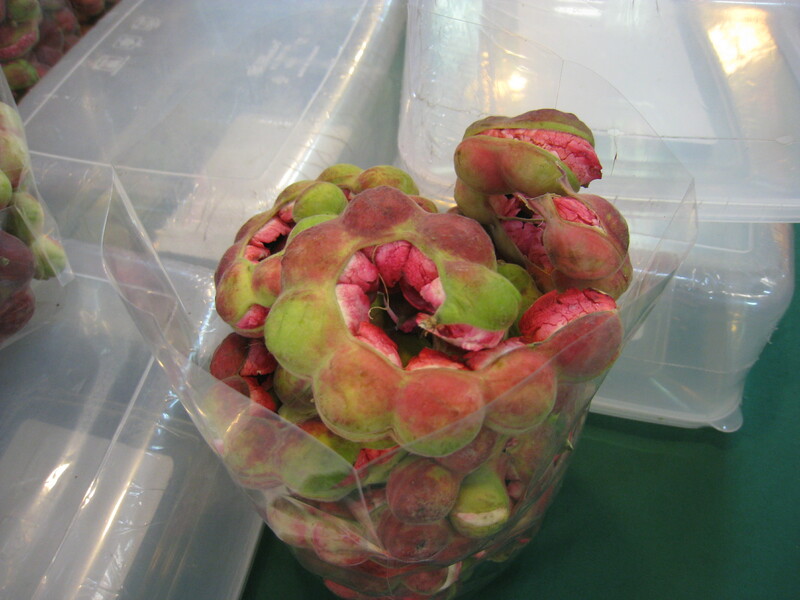 And mangosteens and durian were for sale, even though they’re not in season in Bangkok at the moment. I think I dragged my chin all over the market, oggling the bottles of passion fruit juice for 30 baht. 1$ That would cost a leg back home!! I didn’t even make it to the prepared food section. I mean I did..I just didn’t have any room left anymore. I was silly and bought too many things at Chatuchak and by the time I made it to Ortorkar, I was full (to say the least)! So today, I’m going to do things differently. I’m going to buy myself some horse blinders and head straight to the fruit market. All the great shoe bargains and hair clips can wait. I have a mission to try what Ortorkar is offering. And so should you next time you find yourself in Bangkok. Check out the weekend market in the late afternoon. Eat some great food and stay for a whiskey at one of the bars with a great local cover band. Hit up Chatuchak in the late afternoon and don’t forget to check out Ortorkar as well! take the Subway (MRT): exit Kampengpet (which drops off directly in the market). Price varies from where you hop on the subway or sky train, but it costs roughly 40 Baht to get there. You can bargain for most any items you see: shoes, plates, statues. Give it a go and have fun! I do not know if it’s just me or if everybody else encountering problems with your blog. It appears as though some of the written text on your content are running off the screen. Can somebody else please provide feedback and let me know if this is happening to them too? This may be a issue with my web browser because I’ve had this happen previously.